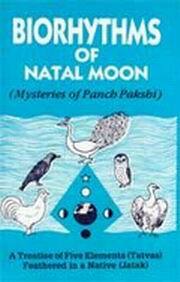 Biorhythms of Natal Moon" otherwise called The Pancha Pakshi Shastra is a golden key in the hand of man which can be used with advantage in any endeavour and in any walk of life unlike the prevalent Biorhythm theories which reckon the cycles of time in terms of days only, too common for all humans. This system was propounded by ancient Tamil Sidha Saints and is now presented in English for the first time for universal benefits by the esteemed author. The system is unfailing as it is based on natural laws of five elements (Pancha Mahabhutas) combined with Astro Stellar force of each individual. This can be successfully applied in all matters of life in the fields of Horary, Electional, Medical Astrology and especially on Natal Astrology. Bibliographic Information: 246p., Tables; 24cm. The book is first time written on the mysterious subject of Prashna Shastra basically and nicely managed by the Author for the Natal astrology. The tables are beutifully given to reach suddenly the result at the point of time for the native. The author has taken great pains to decode the Sutras and formulated for easy and fast prediction. I read it before some 15 years and working on the same till date. There are some differences in the system of prediction according to other version of this mysterios PanchPakshi method by Shri P. P. Vasudevanand Saraswathy (Tembe Maharaj). The book is first time written on the mysterious subject of ..